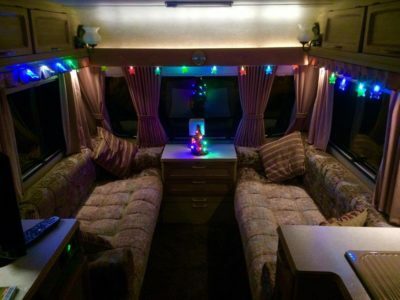 Who’s celebrating Christmas and New Year in their caravan or motorhome? It’s the most wonderful time of the year according to the famous Christmas song by Andy Williams. So, will you be packing up the festive goodies, party games and winter woollies to celebrate Christmas or New Year in your caravan or motorhome? Vote now in our latest online poll so we can find out how many of our readers will be celebrating in their ‘van over the festive period. Or maybe you’ll be using the ‘van on the drive for visitors to stay or to store or cook the extra food or chill the wine? Feel free to share your festive stories in the comments box below. Will you be celebrating Christmas or New Year in your caravan or motorhome? We’ll report back the results in January 2017. Don’t forget our touring caravan and motorhome insurance policies give you extensive cover whilst touring or when your ‘van is in storage, against risks such as fire, theft, storm, flood and accidental damage. Just make sure you let us know if you move your caravan or motorhome to a different storage location over the festive period so you insurance cover remains in place. New Year at Hillhead in Devon with 2 other couples, done it before and had a great time. Lots of entertainment laid on, a superb buffet, with fireworks to finish it all off at midnight. Sounds like a good trip Jay. Hope you had a wonderful time. I will be spending my birthday with my wife Ann on the 31st December at a lovely camp site near Looe Cornwall at Camping Caradon Touring park. We will be inviting our fellow campers to join us at 11am to join us for a slice of cake and a drink. If you are in area please feel welcome to join us. What a great way to spend a birthday. Hope you have a fabulous time. 2016 in Camping Luminoso, Sicily. Two and a half years on the road and we still find Christmas somewhere different a challenge, but fun. This year, for the first time, we are not amongst a group of English speaking people, which is strange to say the least. It’s Christmas Eve and all the Germans and Danish people are out celebrating a day early. We are taking our motorhome Gino de Camper (!) to the car park at Disneyland Oaris for 3 days then onto a campsite on the Seine! Sounds like you have an exciting time coming up Debi. Thanks for sharing. Have fun in France. We will be celebrating New Year with 7 other caravans round a friend’s house some 60 miles away. We will be there for 4 days and will arrange group walks, outings and meals! What a wonderful way to start 2017 John. We hope you have a fantastic time.